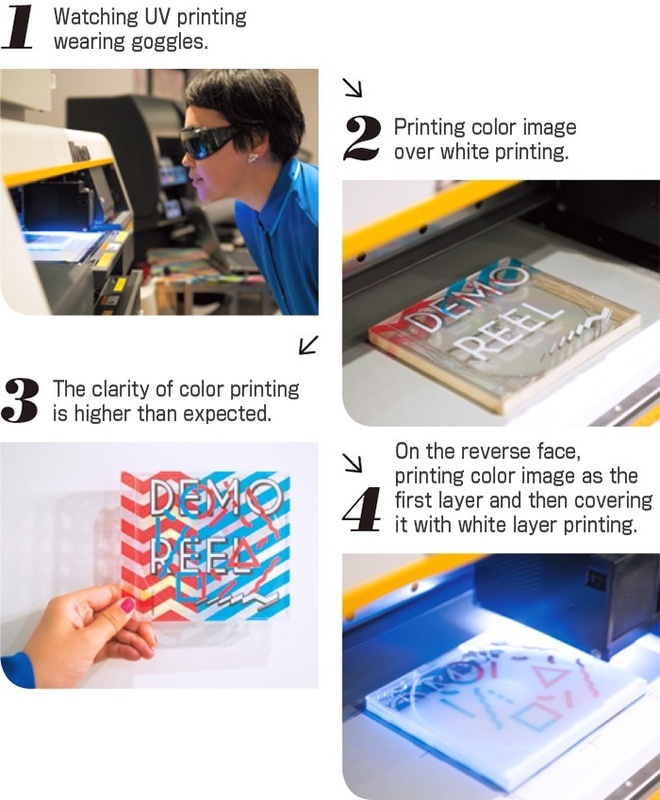 UJF-3042HG collaborates with Taeko Isu, a designer/creator, at Happy Printers, a custom print shop in Tokyo, Japan. This project is published in MdN, a total information magazine for design and graphics. * The following article is reprinted from the November 2013 issue of MdN Magazine. 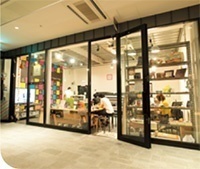 A custom print shop, Happy Printers, has newly opened in Tokyo, offering the Mimaki UV inkjet printer UJF-3042HG. A designer, Taeko Isu experiences the UJF-3042HG. Taeko brought plastic CD cases and buttons made of varied materials. She says, “How wonderful!” and forgets all about the time while watching the UJF-3042HG print. “A clear CD case” was the first thing that came to Taeko’s mind after hearing that the UJF-3042HG prints on transparent materials. The gray layer print is essential for decreasing transmission of light and obtaining an opaque white finish on the reverse face. Case B: Making unique buttons to spice up clothes! Not only apparels but also accessories are ideal applications. UJF-3042HG represents my design faithfully, so I can make both of gifts and artworks! After the printing, Taeko was very excited about the quality of the UJF-3042HG. She was again motivated to make something wonderful out of the printed goods in her hand. 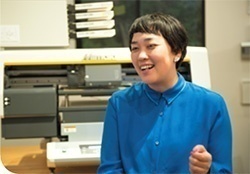 Taeko: While printing CD cases, I found it very difficult to control white ink printing, but it is also very interesting. To obtain an ideal white color printing, I need to consider the degree of light shielding or transmittance when designing the print image. Print technology is “digital,” but the total working processes are like “analog.” I enjoyed both methods of working and creating works of art by hand, which I have not felt for a long time. The small letters are clear and edge lines are very sharp. Furthermore, I was surprised when I touched the printed objects right after printing! UV ink dries so quickly! 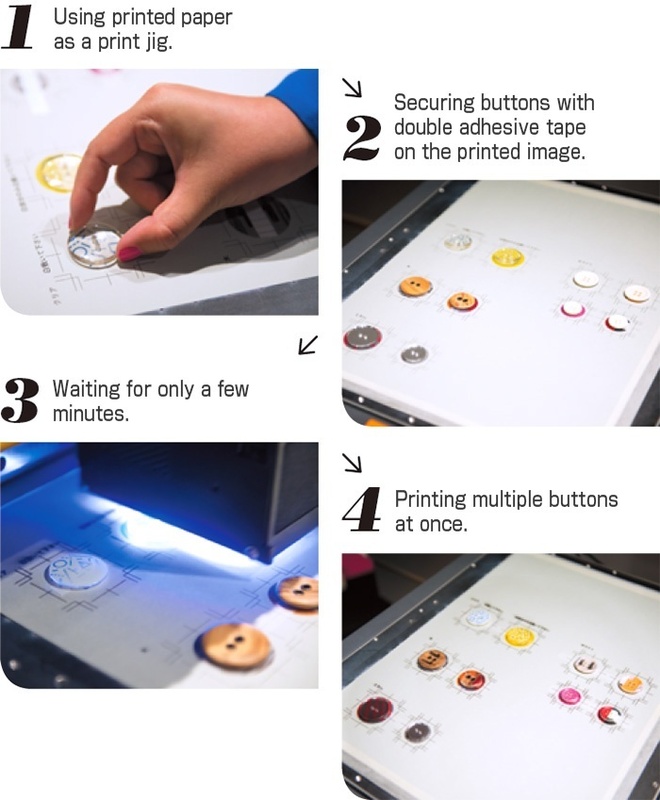 When printing on buttons, I also learned that UJF-3042HG enables me to print on a wide range of materials. Making my own original print goods using the UJF-3042HG is the most delightful work! I don’t need to ask someone outside to finish my work. 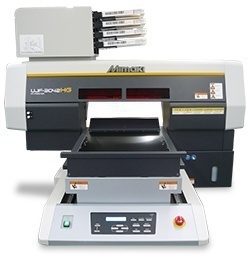 I would like to use the UJF-3042HG for making gifts and customized goods. 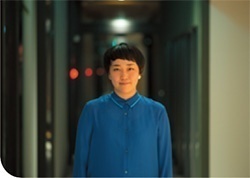 A member of a design unit of NNNNY consisting of five creators, Gabin Itoh, Taeko Isu, Kei Ogiwara, Matt Fargo, and Yohsuke Hayashi. Whether working with paper or electronic media, she is constantly designing and completing art activities. A print shop that provides print services to clients utilizing professional-use printers.